Imagine being able to order gourmet cupcakes and have them delivered to your house, or picking them up at a mobile cupcake truck. Dream no more, this is the reality for the Capital District of New York. When I first saw the Fluffalicious truck driving around the region, I was curious. Curiosity led me to Facebook where I found more information. They have a website coming soon Fluffalicious.com, but it is still being constructed. On Monday, I read that the truck was going to be stationed near a store that I had to go to. This was perfect timing. TechyDad was home sick that day, and I thought cupcakes would help to perk him up. The first night, we selected three cupcakes and cut them into four pieces to share. See, we were not piggies and wanted to have something to look forward to the next night. 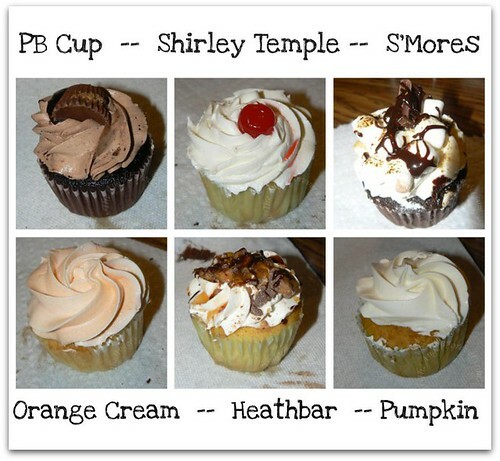 I plan on further reviewing our cupcake experience, but wanted to quickly note –> THEY WERE DELICIOUS! The cupcakes were fresh, moist, and full of the flavors you would expect from their titles. We took a lot of photos of the inside of the cupcakes, because they really do tell a story. They did not disappoint and my two big kids (that including TechyDad) keep asking to try more. 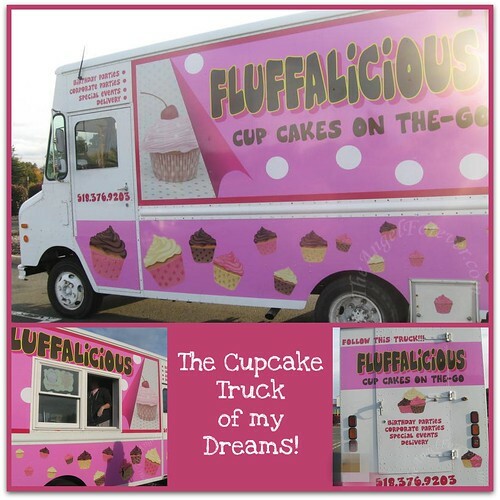 Do you have a mobile cupcake truck by you? If you could create your own cupcake flavor masterpiece, what would it be? How Yummy!! I wish there was one of those around here! How about a banana bread cupcake? I would like to try all of those in the picture! YUM! I wish there was a mobile cupcake truck in my area. The only flavor I like is Dark Chocolate with Vanilla frosting. We have several mobile cupcake trucks in our area. I like mango so my masterpiece would include it. No we do not. I think that would be very dangerous for us.,lol. How could a loose the weight. I love cupcakes! too tempting. I WANT THAT TRUCK!!!!! MUST HAVE IT!!!!! I don’t think we have this in our area – it’s a cool idea! Seriously, though, I’d love this during the summer instead of the ice cream truck. Why get a frozen treat for $4 that you could buy a box of in the store for the same price (or less) when you could stop the truck, choose PB cup and get a wonderfully tasty cupcake? OMG I WANT ONE OF THOSE IN MY TOWN!!!! 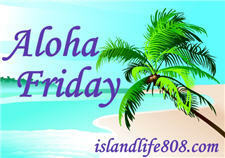 Here is my ALOHA FRIDAY! Nope but that’s pretty cool! We don’t not sure what flavor I would create. We have several trucks near my work and I have tried a couple, but none of them look as delicious as the 6 you picked up. I really want to know how the Shirley Temple cupcake was since it looks awesome. My cupcake masterpiece would need to include apples…maybe a carmel apple cupcake or a candy apple cupcake as it is near Halloween! No cupcake truck in fact I’ve never heard of one. To make up a cupcake I think a peanut butter and chocolate cupcake with coconut sprinkles. xmasdolly´s last blog post ..WORDLESS WEDNESDAY! That’s just amazing! Way way better than an ice cream truck, what fun it would be sell to cup cakes at the park instead. LOL I’m glad you got to try them. OMG those look so good! I would totally want anything with coconut!